I am having a serious lull of activity in my life, thus the blog and my brain are really having to stretch to find interesting things to write about. Google to the rescue though, I found this random topic generator! My first bus ride is nothing out of the ordinary, I think it was just the first day of Kindergarten, and like any naive 5 year old, I thought it was awesome. Then after riding it for a bunch of years afterwards until I was graced with highschool friends with cars, I learned it was hot and smelly and crowded and uncomfortable. Not a fan. It will most likely be a more interesting post if I share with you all my fears of public transportation. When I had jury duty last week I could use my summons to ride the Metro for free right to the courthouse. I could have saved 6 bucks! But yeah right, I'm not taking a bus! I am pretty sure I have some sort of low grade anxiety disorder, but it comes out in grand style in certain instances. One of which is taking public transportation. Don't ask me why, I am just weird. Why do I hate it so much? Well allow me to explain. I live in Houston, so public transportation is non-existent to a large degree. So I think my upbringing in this city has contributed to my desire to be in control of where I am traveling to in my own car. The main form of transportation available to Houstonians are buses. The people I see at the bus stops in my neck of the woods look totally sketchy, so that is a downside. The buses look pretty old on the outside, so I can only imagine what the inside cleanliness situation is like. Then you have to wait for the bus to get you to your destination, and usually the weather here is awful. I can wait in freezing rain, or flesh melting heat and humidity the rest of the year. I wouldn't expect to arrive at my destination looking presentable. Then there is the problem of getting where you're going. There are 75 million(approximate.) buses at any given moment, and have you tried to read a bus schedule!? Good luck! And buses are totally freestyle. I can do trains any day of the week over a bus because they have a track they are committed to. You know exactly where it is going. Buses can go anywhere a road is, so who knows if you will get somewhere AND be able to get home. It is too scary to even consider. Especially when you are in a huge place like Houston. So me taking the bus just isn't going to happen. I am less hesitant to take the MetroRail. It is this hip little train thing that just goes within a smallish area of downtown/Rice U/Medical Center areas of town. It is on a track, so I know where exactly I will wind up and that I surely will be able to get to the place I started at. I just don't know where I should park to catch a train. No station is in walking distance, so if I am already in my car, what is the point? Plus I'd have to figure out how to buy a ticket, and the time schedule. It is still a scary situation for me. And cabs, that is like the next best thing to having a car, right? Well let me tell you, last summer Aaron and I grabbed a cab from the airport when we got back from Bermuda and it was bad. Granted, our plane got in at like 2 in the morning however: The cab sounded like it would break down at any give moment, secondly, it was filthy in there and we had to attempt to not touch a thing, and I am pretty sure our driver was on drugs and acting super weird and driving extremely recklessly. We kissed the ground when we got out of that car! NYC cabs, fantastic! Houston cabs, no thanks. I will say that when I am travelling, I typically have no issue with public transportation. I think this is due to the fact that I am with another person, and I can handle being lost if I am not by myself. Plus I am in a place where everything is foreign to me, so I am already at a higher level of anxiety than normal. The nervousness of taking public transportation doesn't register as such a high jump from the starting point. So yeah, I am not going to be taking public transportation if I can help it. What are your irrational fears?? When I was growing up my mom didn't have her own car, so I learned to take the bus with her. It kinda sucked then, but I'm glad I did because I'm pretty cool with taking the bus. I take it here once in while since Erik and I share a car. Nowadays it so easy to figure out the schedule-- google maps does it all for you! But there are def a lot of characters on public transit! 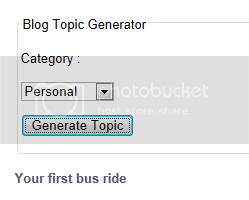 1) I have been looking for a topic generator, I found one a while ago that is a Google Docs spreadsheet, but it's kind of wonky. 2) I actually have a phobia of riding on buses. Panic attacks and everything. Once, when riding a bus to the airport in Chicago during rainy weather, I literally cried the entire way there, I was so scared. Sigh.